Cool photo alert! James Zheng’s lab at Emory is uncommonly good at making photos and movies showing how neurons remodel themselves. They recently published a paper in Journal of Cell Biology showing how dendritic spines, which are small protrusions on neurons, contain concentrated pools of G-actin. Think of actin monomers like Lego bricks. They can lock together in regular structures, or they can slosh around in a jumble. If the cell wants to build something, it needs to grab some of that slosh (G-actin) and turn them into filaments. Remodeling involves breaking down the filaments. 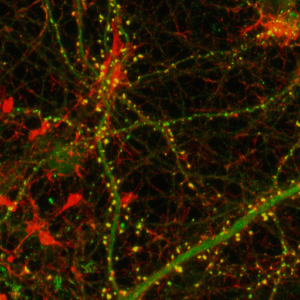 At Lab Land’s request, postdoc and lead author Wenliang Lei picked out his favorite photos of neurons, which show F-actin in red and G-actin in green. Zheng’s lab has developed probes that specifically label the F- and G- forms. Where both forms are present, such as in the dendritic spines, an orange or yellow color appears. 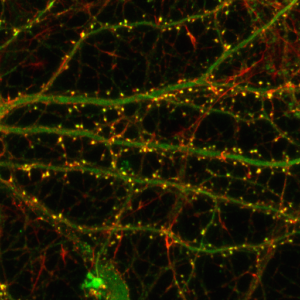 Why care about actin and dendritic spines? 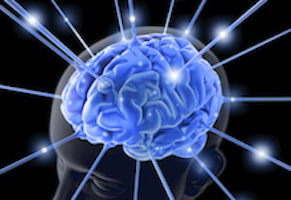 *The Journal of Cell Biology paper identified the protein profilin as stabilizing neurons’ pool of G-actin. 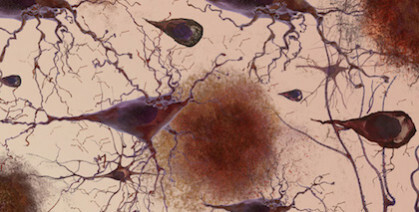 Profilin is mutated in some cases of ALS (amyotrophic lateral sclerosis), although exactly how the mutations affect actin dynamics is now under investigation. Actin is a very abundant protein found in animals, plants and fungi that forms filaments, making up the cellâ€™s internal skeleton. What we are seeing with retrograde flow is that molecules of actin are being added to one end of the filaments while coming loose from the other end. Zhengâ€™s laboratory is studying a protein called cofilin, which disassembles actin filaments. Using a technique called CALI (chromophore-assisted laser inactivation) the scientists http://www.troakley.com/ used a laser to blast cofilin, inactivating it. This is why, partway through the loop, after the word CALI appears, the flow slows down. Postdoctoral fellow Eric Vitriol is the lead author on a paper in Molecular Biology of the Cell that includes these videos. This month’s Image feature highlights lamellipodia, the thin sheet-like regions at the leading edges of migrating cells.Â Lamellipodia act as tiny creeping motors that pull the cell forward. To help visualize lamellipodia, Adriana Simionescu-Bankston, a graduate student in Grace Pavlath’s lab, provided us with this photo of muscle cells. The red box shows an example of lamellipodia. Notice the edge of the cell, where the green color is more intense. 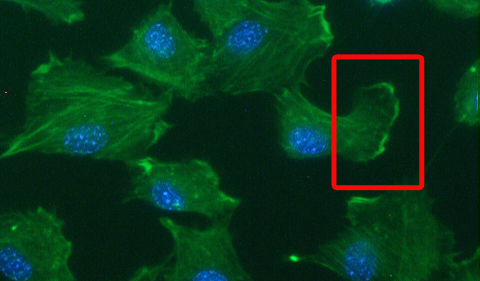 The green color comes from FITC-phalloidin, which stains F-actin, the Ray Ban outlet filaments that make up a large part of the cells’ internal skeleton. (Phalloidin is an actin-binding toxin originally isolated from death cap mushrooms, and FITC is what makes it green.) The blue color comes from DAPI, a dye that stains the DNA in the nucleus. Simionescu-Bankston and Pavlath recently published a paper in the journal Developmental Biology, examining the function of a protein called Bin3 in muscle development and regeneration. They found that Bin3 appears to regulate lamellipodia formation; in mice that lack Bin3, muscle cells have fewer lamellipodia and the muscle tissues regenerate slower after injury. Bin3 is also important in the eye, since the “knockout” mice develop cataracts soon after birth.